United Nations Secretary General Antonio Guterres addresses the United Nations Security Council, Aug. 29, 2018, at the U.N. headquarters in New York. U.N. Secretary-General Antonio Guterres expressed deep concern Wednesday that there could be a “humanitarian catastrophe” in the Syrian province of Idlib if there is a full-scale military operation there. The government of President Bashar al-Assad, with support from Russia, has said it plans to clear the area of militants from the Nusrah Front. There has been a surge in air strikes and shelling in the area this month, raising fears of an all-out offensive similar to what happened previously in Aleppo and Eastern Ghouta. "Idlib is the last major stronghold of terrorists who are trying to gamble on the status of the de-escalation zone and hold civilians as human shields and bring the armed formations ready for negotiations with the Syrian government to their knees,” Russian Foreign Minister Sergey Lavrov said in Moscow earlier Wednesday according to the state-run Itar-Tass news agency. “So, from all standpoints, this ‘abscess’ has to be liquidated," he added. 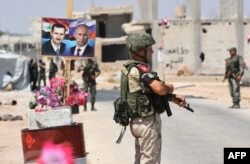 Members of Russian and Syrian forces stand guard at the Abu Duhur crossing on the eastern edge of Idlib province, Aug. 20, 2018. Some 3 million people live in the northwestern Idlib governorate, including more than a million who were displaced from other parts of Syria. The U.N. says more than 2 million people in Idlib need humanitarian assistance and that aid agencies are prepositioning supplies to prepare for a further deterioration in the situation. 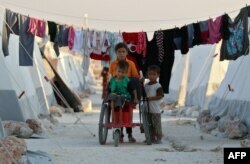 Displaced Syrian children push a boy with disability on makeshift wheelchair at a camp for displaced people in the northern Idlib province, Aug. 29, 2018. A report from the Syrian news agency SANA Wednesday claimed that Turkish trucks “under the supervision of foreign mercenaries” and with help from the White Helmets were transporting gas cylinders into Idlib. The report said, “About 20 people with dark brown skin who speak French and English” took part in the operation.